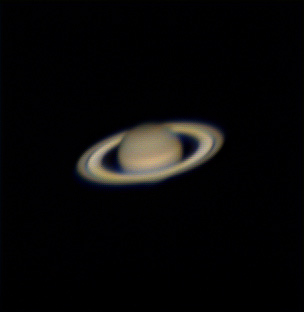 Had a pretty good planetary imaging session last night. I managed to grab my first Saturn of the year. Despite still being fairly low down in the sky at the time it was visible to me (i.e. not behind trees etc), I am still quite pleased with the image I managed to get. When planets are lower in the sky, there’s more atmosphere for the light to travel through. This equals more instability, and so less detail. The stacking process helps to smooth this out to a limited degree, but detail is always better when the object itself is higher in the sky. This is a capture through my 200p (8″) Newtonian telescope with a 2.5x Revelation Barlow lens, mounted on the HEQ5 Pro mount. It’s taken via a video file of 8000 frames over a few minutes, and the resulting video processed to bring out the detail using Autostakkert and Registax. The camera is the ZW Optics ASI120MC. The use of a Barlow lens is what makes images of this size possible. Without the Barlow, the planet itself would be much smaller on the imaging chip, and there’s be no way you could resolve such fine detail. The barlow lens does the equivalent of making the telescope tube longer by 2.5x, so effectively, rather than having a 1200mm long telescope, it’s a 3000mm long telescope (3 metres!). The longer the scope, the more the magnification, but the dimmer the image. Next up is Mars. Looking smaller than this time last month (when I captured it last), and also looking distinctly gibbous (i.e. not fully illuminated, so a little ‘off-round’). I didn’t actually know that Mars could appear like this from Earth. I’ve never had the chance to image it like this in the past, so never actually noticed (as visually it’s a quite difficult object!). Again, the planetary detail is really pleasing. Despite being a smaller object, I’m amazed how much you can see. The mottled surface shows up well, with the clouds being clearly visible on the left of the planet, and the polar ice cap at about 11 O’clock. The reason it now looks smaller is that the Earth is on its way past it’s closest encounter with Mars this year (that happened last month). It’ll gradually get smaller and smaller as we move around out orbit. It’ll eventually start to get bigger again, and we’ll get another opposition (closest encounter) in about 2 years time. This opposition, it got to about 15 arc seconds in size. Next time, it’s 18 (in 2016). In 2018, we have a treat, as it reaches 24.1 arc seconds. That’ll be the time to capture it! It’s currently about 13 arc seconds in diameter (in this capture), so it’ll appear at almost twice the diameter in 2018. Looking forward to that one!